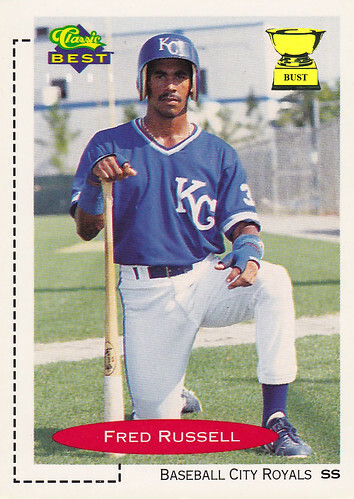 Kansas City Royals' scouting report on minor leaguer Fred Russell: "Hold on, is this right? We have a minor league team in 'Baseball City'? Who are we kidding? ... All right, let's see. He wears a batting helmet three sizes too large for his head, so concussions won't be a problem. ... Might be a five-tool player if all five tools were speed. ... Once hung out with the drummer from Winger. ... Fills up the stat sheet. Especially errors, strikeouts and GIDPs. ... We might want to pay him a little more. He only seems to be able to afford two-fingered batting gloves. ... He takes his kneeling seriously. Going to suggest he switch to football, for his sake and ours."